Happy start to the Labor Day weekend for all my fellow Americans! Labor Day always seemed to be the unofficial start to Fall. School either is about to start or already started. Starbucks has released the Pumpkin Spice Lattes. And Football is just a week away from starting! Since Fall is right around the corner, it is fitting that Fall nail polish collections are being released left and right. And today I have for you guys one of my all time favorite indie brands … Super Chic Lacquer. Super Chic Lacquer’s Fall collection’s theme is Into the Woods. For all of you who don’t know, Into the Woods was first a book, then a musical and now is soon to be a movie with Meryl Streep, Johnny Depp and Anna Kendrick that is coming out on Christmas Day. Confession time … when I was in middle school and high school, I was way into theater! I was even in this play once! Although I had a very small part, I still love the mash up of fairy tales. So this collection totally spoke to me. This is a 10 piece collection and each polish is COMPLEX! The word “complex” deserved to be in all caps because there are flakes, holographic shimmer, color-shifting shimmer and microglitter that make each polish unique to my collection. So hopefully my photos do this collection justice. Super Chic Lacquer describes this shade as “a black base with strong blue iridescent shimmer, holographic effects and hints of blue chrome flash.” Honestly, I couldn’t have said it better. Witches Agenda for Uberness is a gorgeous blackened based with strong blue shimmer and it looks like a galaxy in the bottle. This is 2 coats, but if you’re someone who likes to do thin coats you may need 3. Next … Nightshade Serum to Youth, Like Actually! Super Chic Lacquer describes this shade as “a lush eggplant purple base with contrasting green iridescent shimmer, vibrate green chrome flash and holographic effects.” Nightshade Serum to Youth, Like Actually! is a beautiful eggplant base with a strong green flash. My pictures do not do the green flash justice! It is very apparent on your nails in real life. This is also a little sheer, this is 3 coats. Super Chic Lacquer describes this shade as “a muted deep lush blue-gray with contrasting fiery-copper iridescent shimmer and holographic effects.” Baker’s Hunger for a Bun in the Oven is one of my favorites in the whole collection! My pictures definitely don’t show the true brilliance of this polish! It is a blue-gray base with copper shimmer and a scattered holographic. When you’re out in the sunlight, the holographic and the shimmer are really intense and super gorgeous! Again, a little sheer and needed 3 coats. 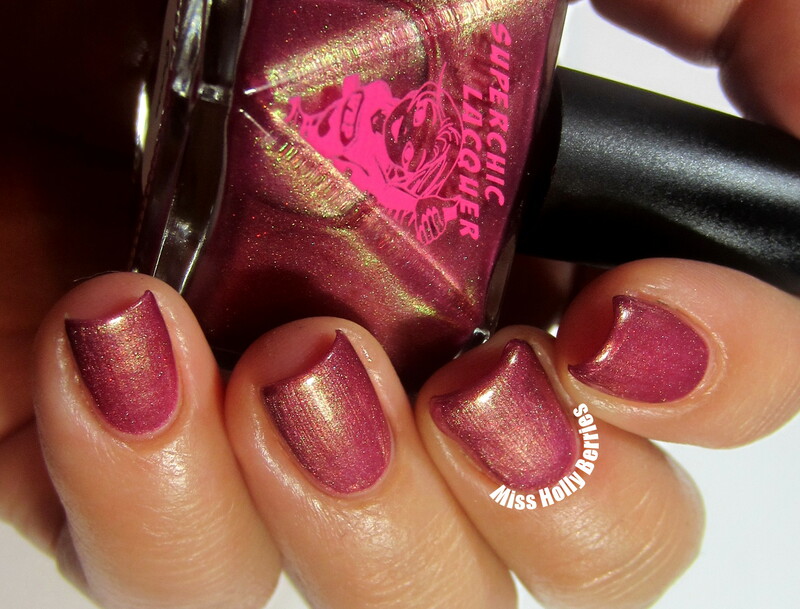 Super Chic Lacquer describes this shade as “a succulent apple-cranberry based adorned with strong contrasting flashes of green to gold iridescence, chrome and holographic effects.” Golden Delicious Curse is a lighter brick red base with strong green flashes. The green is a lot more apparent on your nails in real life. This is the only shade in the collection that is more of a metallic or duochrome rather a complex shimmer. It’s one of the coolest color combos, but it is also streaky. This is 2 coats. Super Chic Lacquer describes this shade as “a rich dark chocolate base with hints of silver chrome and iridescent flash to a subtle taupeness and embellished with holographic and brilliant red shimmer effects.” My good friend and fellow blogger/vlogger said that Bedtime Nom Noms for Mr. Wolf looks like what she wanted OPI “My Private Jet” to be, and the second she said that it was like a light bulb went off! This is an amped up version of MPJ and totally gorgeous. There’s a scattered holographic and red flashes in a charcoal base and just totally complex. This is 3 coats. Super Chic Lacquer describes this shade as “a vibrant golden yellow base with strong fiery-copper iridescent, subtle holographic and brilliant red shimmer effects.” Let Your Hair Down and Take a Selfie is a bright brassy (almost mustard) yellow metallic with copper shipper and red microglitter. You guys know I have a love affair with yellow polish and this is no exception. Since it has oranges and reds, and almost has a mustardish hue, I think this is the perfect fall yellow. This was 1 of 2 shades in the collection that were more sheer than the rest. Overall, the collection is on the sheer side but this is 3 coats and you can still see a visible nail line. Since it is a metallic, I bet you could use this as a layering polish. I’m really tempted to try it over an olive green. Super Chic Lacquer describes this shade as “a lush artichoke green with strong contrasting fiery iridescent, holographic and green shimmer effects.” You Don’t Know Jack about my Beans is another one of my favorites! It seems to be an olive green with strong copper shimmer and holographic! Totally amazing! This was the other shade that was the most sheer. This is 3 coats, but the 3rd coat was pretty thick in order to get it to cover. I want to try layering this over a dark forest green! I think that would be gorgeous. Super Chic Lacquer describes this shade as “the purest gold metallic base adorned with strong blue iridescent shimmer and holographic effects.” If the Golden Slipper Fits is a total shift changer. In my pictures it looks like a champagne gold metallic with a ton of iridescent flakes. But when you’re in the sunlight, it is a gorgeous scattered holographic. Very gorgeous! Again, a little sheer but would be amazing as a topper. This is 3 coats. Super Chic Lacquer describes this shade as “a rich oxblood red base embellished with strong copper iridescence shimmer and holographic effects.” Little Vampy Riding Hood is another one of my favorites. It is a deep oxblood red that just seems to shine from the inside out, with copper and holographic shimmers. So gorgeous. This is 2 coats. Super Chic Lacquer describes this shade as “a vibrant violet base with strong contrasting golden green chrome and iridescent, subtle holographic and green shimmer effects.” Fumbling Fairytales is kind hard to describe. This has iridescent flakes, some matte darker microglitters, green duochrome shimmers, and always seems to be changing colors! The green color-shifting shimmer is much more prominent in real life. This is 3 coats. Overall … all I can say is WOW! I know that indie polish makers are shifting from making the crazy glitter bombs to some more complex shimmery shades, but in my opinion, Super Chic Lacquer does it the best and was one of the first to do it (besides Takko Lacquer). All of these are complex and the type of shades that will make you stop and stare at your nails to pick out each individual color. This collection is available starting Labor Day, Monday September 1, 2014, on the Wonder Beauty Product’s Etsy page. My favorites are Baker’s Hunger for a Bun in the Oven, You Don’t Know Jack About My Beans, and Little Vampy Riding Hood. What do you guys think? Which one is your favorite? ← Luxe Lacquers July Luxe Box Review!